Hate those WordPress themes with thousands of options? We got you the perfect Deal! 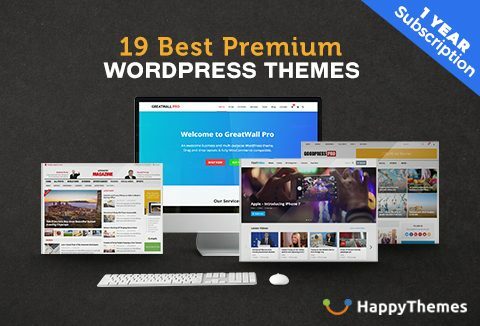 Build great websites using 19 of the Best Premium WordPress Themes from Happy Themes. Start your own blog, website and online business quickly and amazingly with these clean, fast loading, flexible and easy-to-use themes. Pay one time and enjoy all these wonderful themes for $24.5 only. Buy Now! GoodPress is an outstanding and responsive (mobile-friendly) magazine theme that lets you write posts easily. The GoodPress theme is excellent for a news, newspaper, magazine, publishing or review site. It uses the best SEO practices that we have in mind. It’s fast, elegant, and very easy to use. In addition, GoodPress is fully WooCommerce compatible. GreatWall is an amazing business and multi-purpose WordPress theme. It comes with a drag & drop page builder and it's fully WooCommerce compatible. The theme will showcase your Business, Corporate, Portfolio, Agency, Photography, Travel Agency, Fitness Center, Restaurant, Hotel, Medical, Construction, Product Landing page, Education, Online Store or just a Blog. The theme has many possibilities. Improve is a super awesome WordPress blogging theme that is built with deals & coupon codes functionalities. With the Improve theme, you can easily run a PRO blog and make money from affiliate programs by offering online deals & coupon codes. Revolution is a modern WordPress theme that lets you write articles and blog posts with ease. The Revolution theme is excellent for a news portal, newspaper, magazine, lifestyle or review site. If your website is related to news, fashion, sport, tech, travel, food, car or blog, then the Revolution theme is a great solution for you. Revolution is the perfect combination of beautiful and professional design with tons of powerful features. Standard is a premium WordPress blog magazine theme that best suited for new WordPress users, PRO bloggers, SEO marketers, and businesses. This theme is fully responsive & mobile-friendly that works great on all kinds of devices (desktop, tablets, and smartphones). Revenue is a premium WordPress blog magazine theme that best suited for new WordPress users, PRO bloggers, SEO marketers, and businesses. This theme is fully responsive & mobile-friendly that works great on all kinds of devices (desktop, tablets, and smartphones). VideoHost is a mobile-friendly, beautiful and fully functional WordPress video theme. With this theme, you can set up your own videos sites quickly. GoodSite is a nice-looking & powerful WordPress magazine theme that lets you write articles and blog posts with ease. The GoodSite theme is excellent for a news, newspaper, magazine, publishing or review site. It uses the best SEO practices that we have in mind. It’s fast, elegant, and very easy to use. In addition, GoodSite supports responsive Google Ads and AdSense. MyShare is stylish WordPress theme that best suited for online bloggers, marketers, and creatives. This theme is fully responsive & mobile-friendly that works great on all kinds of devices (desktop, tablets, and smartphones). Advanced Magazine is a WordPress newspaper theme that lets you write posts easily. The Advanced Magazine theme is excellent for a news, newspaper, magazine, publishing or review site. It uses the best SEO practices that we have in mind. It’s fast, elegant, and very easy to use. In addition, Advanced Magazine supports responsive Google Ads and AdSense. NewsNow is a powerful and responsive (mobile-friendly) WordPress theme that lets you write posts easily. The NewsNow theme is excellent for a news, newspaper, magazine, publishing or review site. It uses the best SEO practices that we have in mind. It’s fast, elegant, and very easy to use. In addition, NewsNow supports responsive Google Ads and AdSense. FastVideo is a beautiful and powerful WordPress video theme. With this theme, you can set up your own videos sites quickly. MakeMoney is stylish WordPress blog theme that built with coupons/deals functionalities. This theme is fully responsive & mobile-friendly that works great on all kinds of devices (desktop, tablets, and smartphones). With the MakeMoney theme, you can easily run a PRO blog and make money from affiliate programs by providing coupon codes. Starter is stylish WordPress blog theme that built with coupons/deals functionalities. This theme is fully responsive & mobile-friendly that works great on all kinds of devices (desktop, tablets, and smartphones). With the Starter theme, you can easily run a PRO blog and make money from affiliate programs by providing coupon codes. VideoNow is a beautiful and fully functional WordPress video theme. With this theme, you can set up your own videos sites quickly. Creating A Website With Happy Themes Is Easy And Quick! Join thousands of customers in building their websites with these stunning WordPress themes.